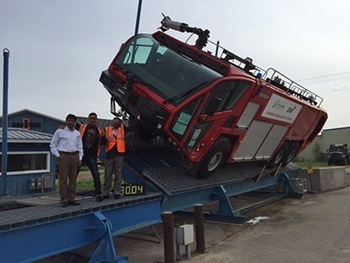 For firefighters, seeing their ARFF unit is arguably one of the most exciting times in the process of getting a new truck. Here at Oshkosh Airport Products, customer vehicle inspections are one of our favorite responsibilities. Vehicle inspections make every team member feel proud to see customers come in with excitement and anticipation knowing they will see and test their new vehicle. We think that inspection plays a vital role in the overall process, and we wanted to share what we believe to be the five most important aspects of a vehicle inspection with you. The myriad of operational tests to choose from allows our customer to make sure their truck is performing at its best. Finally, we share a tour of our plant and do an inspection of loose equipment, if applicable to the truck. 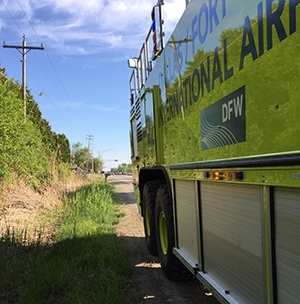 When your unit is responding to an emergency on the runway or patrolling the tarmac, the exterior of the truck is the first thing people see. Inspecting all of the graphics and lettering to make sure they’re perfect is a crucial component of vehicle inspection. The graphics and lettering display your fire station proudly, and if there is a discrepancy, being able to fix it on-site will relieve headaches upon delivery of the unit. Going on a factory tour exposes you to different areas of the manufacturing process. This can be essential for understanding the truck from a maintenance perspective, as well as a having a greater appreciation for how your ARFF unit is built. Seeing the different stages of production can also allow customers to see how each component works because it is stripped down to the basic structure. If you have any questions on why something is put together “that” way now is the time to ask the skilled professionals working on the line. Hospitality is an exciting part of any customer visit and is key to vehicle inspection. Being able to meet the people behind the truck and brand strengthens relationships, opens the door for communication, and helps put a face to a name. You, the customer, should feel comfortable asking any team member a question and know that they will be able to answer it with confidence. Building a relationship with employees also allows an opportunity to decrease post product dissonance. Members from the truck committee will feel better able to communicate any questions or concerns after they take their vehicle back to the firehouse. Performance testing is arguably the most exhilarating part of your vehicle’s inspection. It allows the customer to participate in a wide variety of tests outside the walls of the factory. Additionally, it gives new users of our brand the opportunity to become familiar with the vehicle. We shared a few of the most common tests in our overview at the beginning of the post, but in addition to those you have the opportunity to see the full agent suppression system in action. We take the truck out to the test pad and pump water, test the turrets, and make sure the foam system is working correctly. You are also able to become familiar with the Snozzle if your unit is equipped with this versatile option. Testing allows for quality checks such as testing the pressure and flow rate of the equipment. This is the most crucial and important aspect of vehicle inspection! Comparing the built truck to the specifications is the first thing that is done when a customer does a site visit. 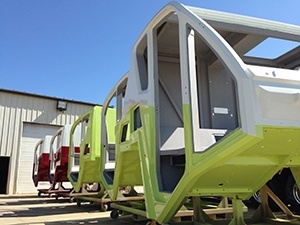 We start at the front of the truck and work our way backwards ensuring that all the options you chose match up with the specifications that were built. The verification process allows us to catch any mistakes that may have been made. People interpret things differently and mistakes happen. It’s easier to fix them at the factory than on location, making specification compliance a key step in the inspection process. If there is a quality concern, an additional request, or a failure during testing, each item is captured with a system called E-Pick. Our team uses pictures and text to describe the problem which is then sent out to engineering, sales, and production teams. E-Pick verifies accountability that the work has been done, as well as provides a guarantee that we will take care of any issue quickly and efficiently. Vehicle inspection is essential to both the customer and Oshkosh Airport Products. It ensures that we are putting out the best quality product and you are receiving a truck that exceeds your expectations. Unfortunately, new AIP regulations aren’t writing visits into the specs as commonly as they used to. Our sales team encourages talking to the FAA to get approval for the visit prior to presenting the specifications. The benefits are endless!